Kache Marpo is the main attendant to Dorje Shugden alongside Namkar Barzin. He is said to be the direct emanation of Hayagriva. Although Kache Marpo takes the appearance of a wordly form, he is fully enlightened. 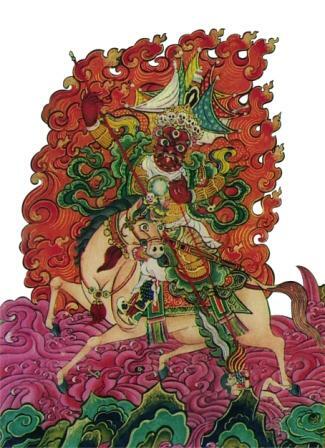 Hayagriva is the wrathful form of Avalokiteshvara. His compassion transforms itself as a fierce and strong energy. He manifests his compassion through wrath to force us to overcome both our inner and outer worldly obstacles, in order for us to practice Dharma smoothly. Therefore, Kache Marpo being an emanation of a Buddha is an Enlightened Protector. He has his own Pujas, Offerings and Rituals separate from Dorje Shugden’s prayers, because he can be practiced as a Dharma Protector on his own. 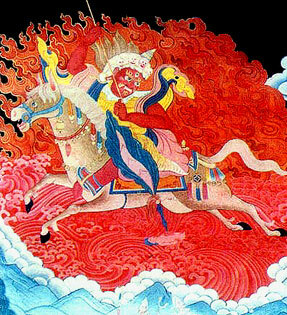 It is said that Kache Marpo waits on his horse outside of the mansion in Dorje Shugden’s mandala to carry messages and lead a wrathful army to conquer our obstacles. Kache Marpo usually takes trance peacefully through an oracle to give instructions and advice. He will check all advice with Dorje Shugden before giving it out to practitioners. Having great respect for Dorje Shugden, Kache Marpo always refers to him as the ‘Great King’. Kache Marpo takes trance of the current Panglung Kuten (Kuten is oracle in Tibetan) who resides in Taiwan. He also takes trance of the Gameng Kuten in the USA. In Tibet, the previous Panglung Kuten was very famous and many people including the 14th Dalai Lama, Trijang Rinpoche, dignitaries and high officials would always consult him. The Panglung Kuten lived in Panglung Retreat near Sera Monastery in Lhasa. When Kache Marpo takes trance of the qualified oracles he may give prophecies, advice, blessings and healing of diseases depending what is necessary. He is very patient and very helpful to those who practice Dharma sincerely. When Kache Marpo takes trance, he may appear wrathful or peaceful depending on the location he is in. If the people in a certain area are aggressive, full of anger and stubborn, Kache Marpo would take on a wrathful form. On the contrary, if the people are compassionate, loving and patient, Kache Marpo would take on a calm and peaceful form. At times when Dorje Shugden and Kache Marpo knows that the people in a certain area will not adhere to their instructions, they will not stay for long during trance nor accept the offerings from the people. This is so that the people will not accumulate more negative karma by disobeying the instructions given. Kache Marpo’s residence is described to be: A brilliant, splendid brown palace made of leather which is surrounded by a red ocean formed by the blood of horses and men. The colour of his body is similar to that produced when the sun shines on a huge mountain of coral. He has the shape of a “son of devas”, with one face and two hands. In his right hand he brandishes a red, sharp lance, with which he pierces the heart of an oath-breaker. His left hand, holding a snare of the spirit which is wound around the neck of an obstacle-creating demon, rests in front of his breast. He wears a leathern cuirass and a leathern helmet adorned with a “banner of victory” with pendants of silk in nine colours. His facial expression is very fierce and he gnaws his lower lip. His eyes have red-gleaming veins, and they stare full of hatred at the evil vighnas. He sits on a very fierce horse, which has spots white like felt and possesses magic qualities – it is mounted with a priceless saddle and carries a front – belt and other horse trimmings. This entry was posted on Saturday, November 26th, 2011 at 12:22 pm	and is filed under Articles. You can follow any responses to this entry through the RSS 2.0 feed. You can leave a response, or trackback from your own site. I have never knew that Kache Marpo is an enlightened protector and he has his own prayers and pujas. I always though that Kache Marpo was just Dorje Shugden’s assistant, never would I have though that he too is an enlightened protector. Through this article I got to better understand who Kache Marpo is, how his features are, as well as why sometimes when the oracle takes trance, both Dorje Shugden and Kache Marpo would not accept some of the offerings that are being offered to them, or that they would not stay long during the trance. Hopefully that more would read up on this article and understand who Kache Marpo is, and getting to know some of the information here that we would have never knew. Are Khache Marpo ( Khache meaning “big mouth” ~ a nickname for Kashmiris & Muslims, Marpo = “red face”) & Sertrab (Wrathful Amitabha) the same being? Their iconography seems indistinguishable.